<Yala peak climbing start from Syabru Bensi after drive 7-8 hours from Katmandu . Apex Nepal Adventure climbing guide led you through lush valley and Tamang village until Kyanjin Gompa then trail heading to Yala peak base camp (4986m) . ANA climbing guide instructed about the Yala peak climbing – how to fixed or blay the rope for ascend / descend and next early morning our guide will take to you Yala peak summit. After summit Yala peak, trail descend till Kyanjin Gompa then either direct Syabru bensi or ascend to Ganjala phedi for Ganja la pass trekking . we Apex Nepal Adventure pvt . 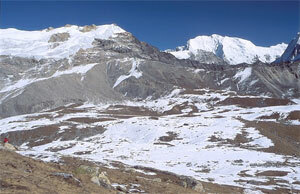 Ltd arrange Yala peak climbing as per travelers / trekkers wish and holiday frame with amazing life time experience. Day 02: After breakfast , our tour guide will take to you sightseeing such as :Boudhhanath: visit Bodhnath Stupa, one of the biggest Buddhist shrines in the world, where we observe Buddhist monks in prayer in the monasteries surrounding the stupa than visit Pashupatinath: the most famous Hindu temple in the country, located on the banks of the holy Bagmati River. Here you see Hindu holy men (sadhus) meditating, pilgrims bathing and occasionally funeral pyres burning on the ghats. Kathmandu durbar square: you will enjoy with different Hindus Temple , Goddes Kumari, legend of kathmadu valley etc. transfer to hotel. Overnight at Kathmandu . Day 15: After breakfast, Relaxing/shopping with own activities , Apex Nepal Adventure's representative will drop to Kathmandu international airport for onward journeys or if you have time to stay in Nepal will arrange any other trip such as Chitwan Junlge safari tour, Lumbini tour, Chitwan jungle safari tour , river rafting etc.